We have something rather exciting today! We’ve tried out the Sonarworks Reference 4 during a couple of live streams, but today we’re going to try out the Sonarworks Reference 4 Studio Edition with a mic. We’re going to ring out my room with 3 different sets of speakers. The software included brings us through the following steps. We have this rather lovely Sonarworks microphone that has an ID on it. In the software we need to type in the ID to ensure flat frequency response and maximum precision. Next, we need to hold the microphone pointing at the Speakers in the middle space between the left and right speakers from a normal distance away. This process tests the input gain and helps the user adjust it to the proper level. Determine the distance between the speakers and measure the speaker distance. And then locating the standard listening spot. For the measurements stage, you are given 2 tones to help you measure the sound of the speakers in the room. This stage is very thorough but gives you some great data to let you know if your speakers are positioned the best they can be in your studio. This is pretty exciting when comparing the calibration profiles! You can really see the differences between the speakers. When the correction function is enabled I am able to see exactly how the Sonarworks Reference 4 Studio Edition is going to balance the sound profile. I like the sound of the midrange when I put the Reference 4 on. The biggest difference I’m noticing is the low end. Put the Sonarworks in and it just sounds like a better mix now, even though it was already an amazing mix. Onto the Focals, we’ll save the little baby Kali’s till the end. Loading up the Focals, the mid-range and high mids were quite a lot softer; they weren’t particularly uneven- there was a little bit of a 12k bump but relatively flat-ish. Extending a little bit more on the low mids, there’s more of a cut than on the Genelecs and more of a boost in the high mids. Even with that boost in the high mids, they are still what I like about them and that’s very interesting! The thing about the Genelecs is that they are very even on the high mids. These Focals are generally down according to Sonarworks. They sound smoother, less harsh and they are great for tracking on for long periods of time. Even with that boost which sounds fantastic, they still sound really nice to my ears. They still sound sweet and they don’t sound offensive and harsh. Which comes from a guy who grew up using NS10’s when I first started. What’s interesting about these speakers is regardless of Sonarworks being on or off they are very very pleasing in the mids. They are more enduring to work on and I think that’s probably why so many people who have Focals love them. These are definitely a lot smoother and a lot more fun to listen to so with or without the EQ I love them. The EQ is definitely bringing up a little bit more of the high mids. The Kali’s got a huge boost, just over 9db approaching 10db. At about 120 they don’t have quite an extended boost but definitely pretty heavy about 250. Then there’s some cuts, a boost and a dip. The highs are fairly flat, but they have a bit of a high boost at about 12db. I like the sound of these little speakers and the artificial low end that they create is actually quite fun to reference on. A lot of speakers on the more affordable end don’t reproduce any low end and people want extended low end! A little baby speaker with a bump on the low end is not a bad thing for me because it’s reproducing what music should sound like. The Kali’s have an amazing low end for a tiny little speaker-the high-mids are pretty flat. With Sonarworks engaged with a boost the high mids, it’s giving it width because high mids give us distance. The extra detail in the high mids and some of that low mid cut is a game changer. It’s a whole new world now where we can take all different levels of monitors at varying price ranges and do really dramatic stuff. The reason I Use blue Lolas when mixing is cause they are relatively affordable and I wanted to mix on something some of you may have. When I used the Lolas with Sonarworks it was very revealing in the low end in particular. One of the biggest problems I see when I’m reviewing peoples’ mixes is always in the low end. The low end varies from room to room from headphone to headphone. This software did something for the Focals on the high-mids, but the Focals still have a really beautiful sound in the high-mids so it didn’t make it brash. But on every single set of speakers, whether it be the Genelec’s, Kali’s or the Focal’s, what it did was (very effectively) made up for the fact that there’s a little bit of a low bump. It’s the characteristics of the console and the room that are affecting our speakers swell. This is telling us lots of great things. You can take the Kali’s and improve the sound dramatically and improve the sound and only spend $300. You can also take great speakers like the Focal’s and Genelec’s and even out their issues. This is a great software! My hats off to you Sonarworks! This is going to make a huge difference for many many people. I think this and understanding acoustic treatment this is a huge deal. Thank you for letting us try this! We’re going use this and as you know we are increasingly mixing in the box so this will go on our output stage! 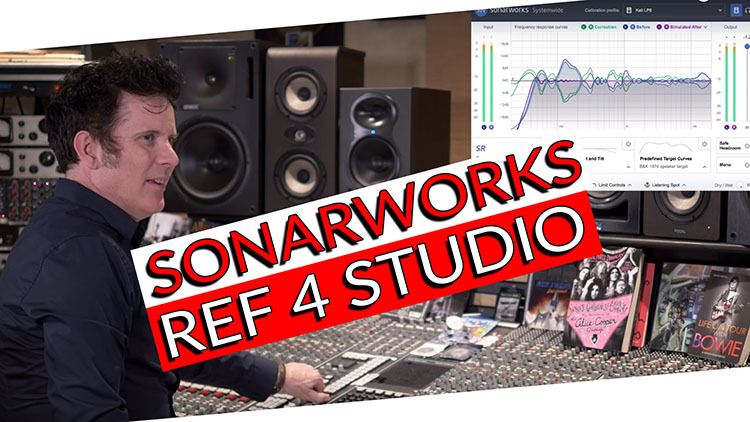 Don’t forget to enter to win the Sonarworks Reference 4 Studio Edition above. I’d like to thank our friends over at Sonarworks for providing us with 3 copies of this plugin to give away to our amazing community!